The Thompson Twins were one of many British bands I liked in the mid-1980s. New wave music trickled into our neighborhood slowly, with a few songs seeping through on WYDD, a station that would play Pat Benetar and the Police, but sneak in songs like “Situation” by Yaz from time to time. It was completely different from the gimme-three-steps, drinking-bourbon-out-of-the-Pepsi-bottle-in-the-back-of-the-van classic rock music that most other guys in my town were contractually obligated to like, and so I soaked up the new sounds. YDD had “The 1260 Club,” an hour of new music every night where I learned about bands like R.E.M and Romeo Void. They also had “Rock Over London,” a weekly show (hosted by Graham Dene) where I would often hear songs months or even a year before they’d ever be released in the States or played on the radio here. These distances in time and sound have been rendered irrelevant by the Internet and technology, but at the time, London felt like it was a million miles away. To hear an hour of music, live from the source, was thrilling. I’m a Thompson Twins fan — I liked them well enough — but unlike some of the music I’ve chosen for earlier entries in this musical memoir of mine, I didn’t select them, or one of my favorite songs from them, “Lay Your Hands On Me,” for this post because their music had a huge, grand impact on me. I selected them because they were part of an ad I placed in a national magazine. 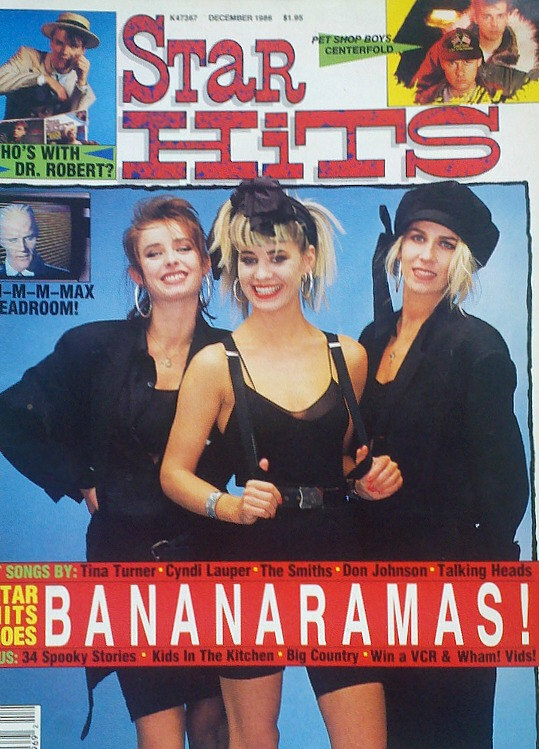 Star Hits was published in the late 1980s as a Stateside version of the long-running UK magazine Smash Hits. My sister Shelle’s teenage music fandom of bands like the Bay City Rollers was published on the pages of teen-girl centered magazines like Tiger Beat. But Star Hits was a publication for the 1980s – as easy to read as USAToday, but with some real content and substance for the beginner music fan, both guys and girls. It would be easy to dismiss something like Star Hits as a promotional rag for teeny bop bands, but they were really good about covering a lot of the bands of the day. They were the source for me to find out about Everything But The Girl, which to this day remains one of my favorite bands. A rare Star Hits cover that did NOT feature Duran Duran. Nestled deep in the pages of Star Hits was a page for pen pals. It was simple: you posted your favorite bands and your contact information, and voila, you had mail. Somewhere in my senior year of high school, I started to send my pen pal request to Star Hits. I can’t remember every band or musician that I listed in my ad, but I know for sure Thompson Twins and OMD were on the list.I’d seen them live a few months before, and it was a great show. Probably Yaz and Alison Moyet, too, and perhaps Siouxsie and the Smiths. After several letters to Star Hits, I was in. Success! There it was, my ad (under a nickname), and a list of the bands and artists I loved. I expected a few letters, but was stunned when our mailbox was soon bulging – literally – with letters. I must have received over a thousand letters that summer. Our mail carrier began to complain to my mother. Then again, he complained to everyone. I learned a lesson from the responses to the ad: A majority of people don’t hear what you say — or read what you write – but instead see or hear what they want the conversation to be. 90 percent of my replies were from Duran Duran fans, or “Durannies,” as we called them. HI I’M BECKY!!!!!!!! I LOVE JOHN TAYLOR AND HORSES….AND PURPLE IS MY FAVORITE COLOR. I HEART JOHN!!! DD ROX! Duran Duran was NOT on my list of preferred bands. Not anywhere. I’ve just never been enthusiastic about them. I’m pretty sure I’ve lost friends and been uninvited from weddings because of this personality defect, but hey, one musn’t compromise one’s beliefs! The Durannies were early spammers, most likely writing to everyone who was listed in that issue, and those letters were another lesson that I learned early and remember often in correspondence, communication and social media: Cut through the noise and focus on the people who are really listening to what you have to say. I did make some fun, interesting friends. There was Emily from Maine, Teresa from Missouri, Monica from Cleveland Heights, and Joanna from Laval, Quebec. These were all smart, funny young women, and their warmth and intelligence shone through in their letters. I did also meet a few guys through the ad. I was pretty inexperienced in the meet-and-greet department, but pen pals allowed me to practice my game from a distance. I remember the cute, quiet guy who was a DJ at a college radio station. He sent me vinyl copies of The Smiths’ “Louder Than Bombs” and a Siouxsie record, and we had a brief correspondence, which included a nice little flirtation. As far as the ad itself, I’m foggy on the details, but I think my home address was indeed published as part of the ad (though I did use a nickname in the ad itself). It’s probably mind-blowing to think of someone doing that today. “Oh hey, I’m a teenager and living with my parents. Here’s my contact info. #kthxbye.” No one got hurt, though. I eventually lost touch with everyone. A few of the girls ran for the exits when I told them I was gay, and they realized that their hopes for a long-distance boyfriend would never come to fruition. I went off to college. My best friend from childhood went to a different college a year later, and when I eventually met his boyfriend, we realized that he’d also done the Star Hits thing, and may have answered my ad. Small world. Technology has changed so much. I only need to open a browser to listen to music from across the ocean. The One Directioners don’t need to share a live address these days – they can follow their “fam” on Twitter. The music industry has changed in many ways, and I’m sad that to some degree, the sense of adventure and discovery has disappeared from mainstream music. But it’s alive and well on YouTube and on sites like Soundcloud and Bandcamp. For all the changes, the ideas are the same: Find interesting new music. Connect with other people who like the same things you do. And watch out for the Durannies — and the One Directioners! Click here to check out other entries!